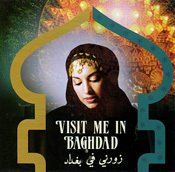 A musical journey though a city of culture - Come to Baghdad! Experience a city immortalized by its rich musical culture. Join us on a musical journey presenting ?takasim? (improvisational solos), soulful rhythms, and immortal folk music. A musical journey though a city of culture - Come to Baghdad! Experience a city immortalized by its rich musical culture. Join us on a musical journey presenting "takasim" (improvisational solos), soulful rhythms, and immortal folk music.